Australian media mogul Reg Grundy has passed away on his Bermuda estate at the age of 92. Reg developed a string of TV hits which defined a decade of Australian TV in the UK including Neighbours, Prisoner: Cell Block H and Sons And Daughters. Anyone born in the 70s and brought up in the 80s will remember his programmes vividly and made foreign english accents and phrases – part of our lexicon. It’s funny how memories can be tied to not only watching programmes but the everyday situations that surrounded them. I cannot see the name of Sons And Daughters without remembering the old woman that I used to visit with a friend on the way home from primary school aged 11 or 12 years. She used to always wave at us with her big beefy hands from the living room window as we’d walk past, with our little brown school bags slung over our shoulders. Then one day, after many months of waving, we decided to knock on her door and say hello. Subsequently, it became a ritual of going in after primary school in Kirkcudbright and saying hello to her and her little budgy. She was a big Sons And Daughters fan and we used to sit and watch it with her – although to be fair, I thought it was a really naff programme (which is maybe why I remember it so much). Here are some memories – in video form. Dollarydoos – the new Australian currency? A petition has been launch to help stimulate the Australian economy by changing the name of the currency to “Dollarydoos”. The campaign which has been started on the Change.com website – is directed towards the countries Shadow Minister for Communications & Broadband Malcolm Turnbull MP and has saw it’s support jump from 8,000 to nearly 35,000 signatures in less that 24 hours. 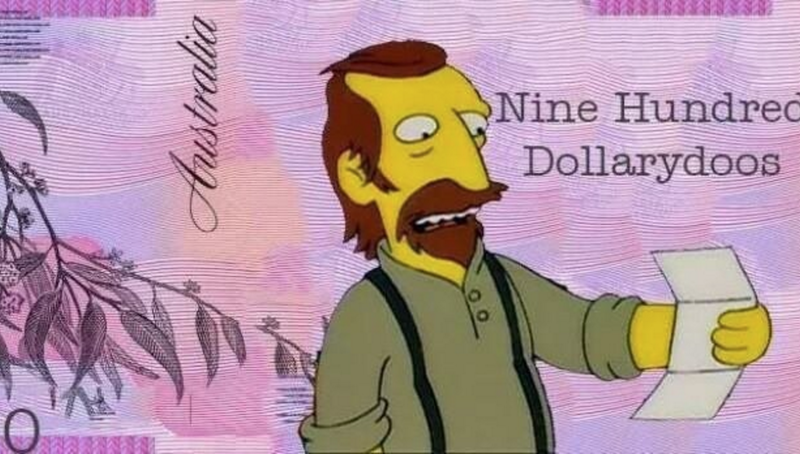 According to the petition – the change to Dollarydoos “will make millions of people around the world want to get their hands on some Australian currency due to the real life Simpsons reference, driving up the value of the Australian currency”. You can add your voice to the campaign here.